Vitamin A is fundamental for healthy vision. Enhancing light and dark sensitivity. Vitamin A seems to play a major role in photosensitivity and adaptation. Combating cataracts and dry eye. Consistent intake of the vitamin may reduce the risk of cataracts, dry eye, and blindness. Promoting good vision. 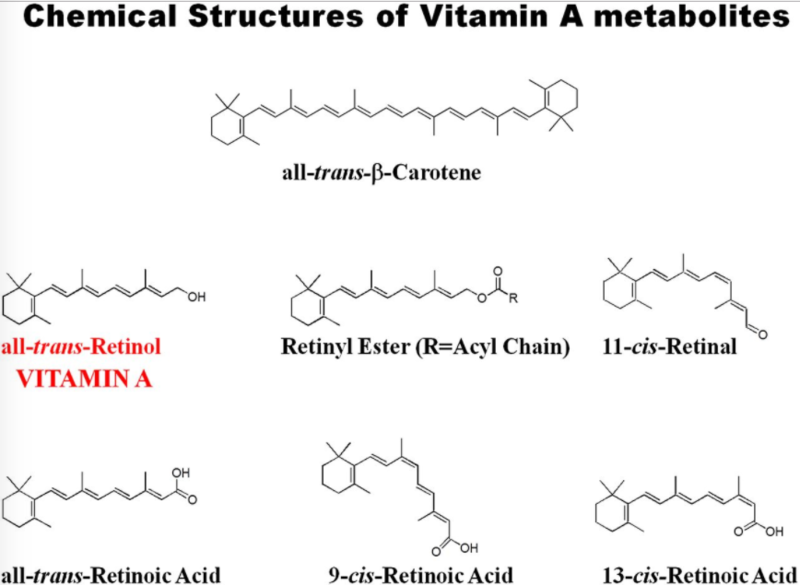 The retinol present in vitamin A is key to healthy eye development. >When grouped together, the compounds retinol, retinoic acid, retinal, and various carotenoids make up the essential vitamin A. The fat-soluble vitamin assists in a plethora of fundamental bodily functions from helping cells multiply (which is essential for maintaining healthy skin and mucous linings as well as for growth) to enhancing the immune system. Retinoids. Retinol is found in beef, chicken, eggs, dairy, and numerous other animal products. Carotenoids. Countless fruits and vegetables — especially ones colored dark-green. yellow, or orange — carry substantial quantities of carotenoids, notably beta-carotene. Beef liver has tons of vitamin A. A 3-ounce serving of beef liver packs roughly 6,582 mcg of vitamin A (22,175 IU), which amounts to more than 4 times the recommended daily value. Vitamin A deficiency is a well-known cause of vision problems, such as dry eye (xerophthalmia), age-related macular degeneration (AMD) and impaired night vision, which is why various health advocates consider the vitamin essential for healthy vision. Currently, its supplemental use has only been proven for treating vitamin A deficiency, although it shows promise in ameliorating eye issues, preventing cataracts, and simply promoting sound vision. Chemical structures of different retinoid species. 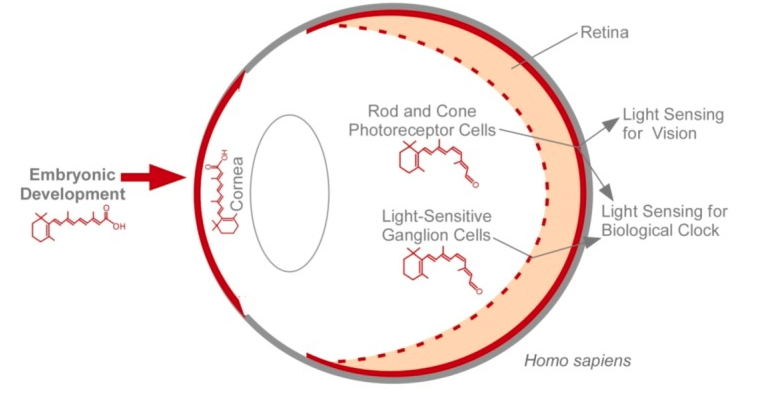 The interplay between vitamin A and eye cells not only activates rhodopsin, which gives eyes the capacity to adapt to darkness3, but also triggers light sensors that are necessary to sense light4 and keep the corneal epithelial cells from drying out or ulcering. While some of the details have yet to be fleshed out, the necessity of vitamin A in eye development speaks volumes to its significance for healthy vision. Vitamin A empowers the human eye to sense light. central role in vision formation and maintenance. From as early as embryonic development, vitamin A – in the form of retinal – helps set up the framework of healthy eyes.5 Once all of the organs of the fetus are fully formed, one of the primary roles of retinol is to maintain suitable eye conditions. Expediting eye healing, both after eye surgery and injury. by UNICEF, vitamin A deficiency (VAD) is “the leading cause of preventable childhood blindness.” One of the immediate consequences of low levels of vitamin A is impaired vision because of how critical retinal is in sustaining healthy eyesight. The good news is that vitamin A supplements may just be able to turn the tide and replenish depleting supplies in cases of vitamin A deficiency. 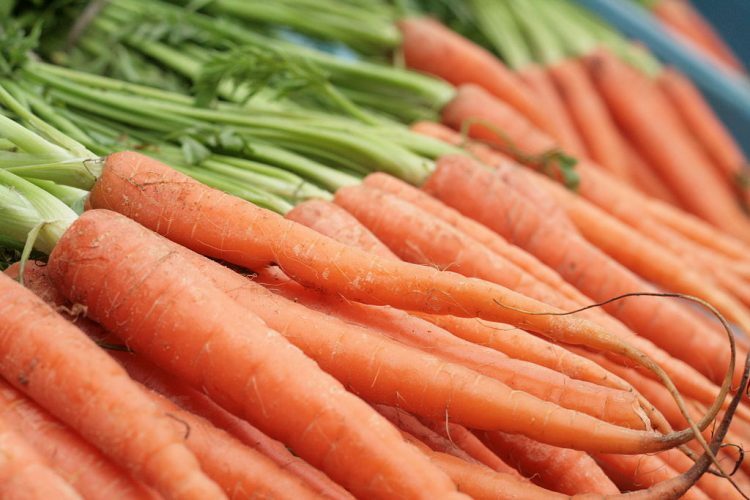 High doses of vitamin A may cause unwanted side effects. Always consult a medical professional when consuming vitamin A at doses higher than the standard recommendation. Amounts greater than 10,000 International Units (about 3 times the standard dose of 900 micrograms) is advised against particularly for pregnant women due to its association with birth defects. udies collectively highlight the ample potential benefits that vitamin A may offer to vision, from protecting against nuclear cataracts and dry eye to improved night vision and visual acuity. Vitamin A may protect against nuclear cataracts in older adults. In this population-based cross-sectional study, 2,900 adults between 49 and 97 years old living in an urban community near Sydney, Australia were given an assortment of nutrients, including vitamin A, and had their eye condition evaluated via lens photography. Vitamin A specifically seemed to reduce the risk of nuclear cataracts. In this randomized and controlled study, 150 patients with dry eye were given either artificial tears, cyclosporine, or vitamin A eye drops 4 times a day for 3 months. Compared to the control, vitamin A led to significant improvement in blurred vision, tear film, and dry eye syndrome. In this single patient case study, a 69-year old male with dry eye and night blindness was given high doses of vitamin A supplements for 1 month. Electroretinograms (ERG) confirmed that scotopic (dim-light vision) function was restored. In this randomized, double-blind investigation, 40 patients who had recently undergone photorefractive keratectomy (eye surgery to correct near-sightedness), were given 25,000 IU retinol palmitate and 230 mg of vitamin E or a placebo 3 times daily for 1 month and 2 times daily for 2 more months thereafter. Vitamin A supplementation resulted in significantly faster re-epithelialization, less haziness, more accurate myopic correction, and significantly better visual acuity. In this cross-sectional investigation, 2873 adults between 49 and 97 years were given various vitamins, including vitamin A, over an extended period of time to determine their effect on cataracts. Vitamin A supplements protected against nuclear cataract (odds ratio 0.4). Vitamin A is often measured in International Units. Vitamin A is routinely measured in International Units (IU). 1 IU is equivalent to 0.3 micrograms of retinol, 0.15 micrograms of beta carotene from dietary supplements, 0.05 micrograms of beta carotene from food, and 0.025 micrograms of alpha carotene. The recommended dose for women is generally smaller (700 mcg) and even lower still for children due to average differences in size and processing. Take vitamin A with food. We recommend taking vitamin A with food for maximum efficiency since it’s absorbed with fat during the digestive process. We recommend vitamin A for vision. Vitamin A is widely regarded as an essential component of natural eye development for its abundance of retinol. Its potential benefits include enhancing light sensitivity and adaptation as well as reducing the risk of vision complications, such as cataracts, dry eye, and blindness. Supplementation is highly recommended in cases of vitamin A deficiency. The ideal way to take vitamin A is as a standardized 900 mcg pill supplement. Sufficient quantities of vitamin A can easily be consumed in the standard diet. Those concerned about vitamin A deficiencies or looking to enhance their vision, may turn to standardized nutrient supplementation to give them the extra stimulus they require.